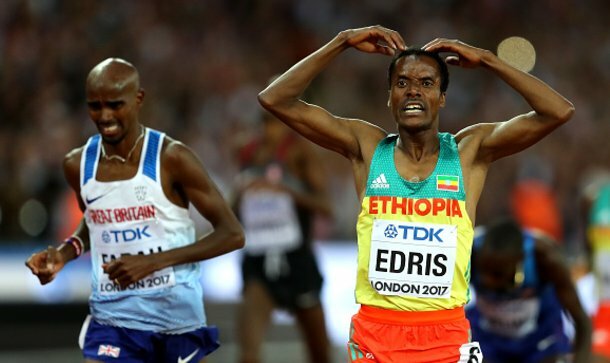 Muktar Edris came from behind to sprint past Farah and his fellow compatriot to win gold which forced Mo Farah to his knees in despair. He was desperate to leave the track with his 7th gold world championship medal, but he has to settle for silver. Mo Farah was at the front throughout the whole race, but as the raced neared its conclusion, Kejelcha and Edris gained distance between themselves and Mo Farah and Chelimo, the Olympic silver medalist. The pain and frustration was etched across Farah’s face as he battled through the line to finish second. Mo Farah retires from the track with 4 Olympic gold medals, 6 gold world championship medals and now has another silver to add to his tally. Since 2011, Farah has been an unbeatable force, but there was no fairytale ending in the Olympic Stadium. Despite his dominance, doubts will always remain over Mo Farah. It was in 2011 where he first burst onto the scene winning gold in this event, after joining coach Alberto Salazar in 2010, who has since been under several investigations over doping allegations. Before London 2012, Farah missed two drugs tests and has also faced doping allegations. However Farah has never been found guilty of doping and no wrongdoing has been proved. But still, questions remain over Farah due to his insistence on being coached by Salazar and the fact that his PR firm has banned the British written press from press conferences and has evaded hard questioning. Despite this, you cannot question his determination to be the best, and you have to admire the fact that, at the age of 34, he is still winning gold medals and is still unbeatable. Farah proved just how difficult it was to win gold medals after he revealed his 120 mile running training regime he goes through every week. His constant pursuit of excellence is laudable but will Farah ever be considered as a legend of the sport, taking into account the allegations? It was a surprisingly successful evening for Britain after the women’s 4x100m relay team won silver, and then later the men took gold in the same event which was the 3rd fastest time ever ran in the event. Before this evening, Britain had to rely on Farah for medals with them failing to match the successes of the 2015 Championships. It was always going to be difficult to match that tally with Jessica Ennis now retired and Greg Rutherford injured, however questions why Britain is not reproducing these stars will undoubtedly be asked. Laura Muir, Dina Asher Smith and Callum Hawkins all finished their events in agonising fourth place. After a disappointing tournament, it is now a real possibility that British Athletics’ funding of £27m will be reduced. What does the future hold for British Athletics after losing another star with Farah turning his hand to marathon running? The aim is to turn those fourth placed finishes into medals in Tokyo 2020, and with a relatively young squad, they have age on their side. But whether we will see the next Rutherford, Farah or Ennis only time will tell.